For the sixth year, students, parents, fire officials and advocates gathered together in Washington, DC, to meet with Congress and discuss campus fire safety legislation. Gail Minger has been an integral part of this effort each time, again serving as a leader of one of the teams. Almost 40 people, assigned to 12 teams, met with 75 Congressional offices over the course of a single day, an amazing undertaking! Campus Fire Safety Capitol Hill Day started as a way to provide support to the Campus Fire Safety Education Act that was introduced by Congressman Pascrell in the aftermath of the tragic Seton Hall University fire that killed three students and the College Fire Prevention Act that had been introduced by the late Congresswoman Stephanie Tubbs Jones. It grew out of conversations with administrators from the University of North Carolina Chapel Hill, where a fire claimed the lives of five students, and the Woodruffs, who had lost their son, Ben, in that fire. It was felt that by bringing a contingent of students to Washington we could impress upon the legislators that this bill was an important one. In 2008, the bill was signed into law, but the efforts did not stop there. Realizing the value of face-to-face meetings with Members or their staff, it was decided that this would be an invaluable exercise to do each year to continue to help promote campus-related legislation. 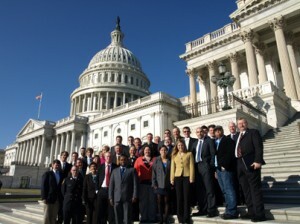 Organized each year by Campus Firewatch, with support from the Ohio Fire Safety Coalition and the Minger Foundation, Capitol Hill Day has grown to include students and advocates from not only UNC, but Eastern Kentucky University, University of Mount Union, Hampden-Sydney College, the George Washington University, University of Maryland and Northeastern University. Fire officials from North Carolina, Ohio, Maryland and Washington, DC have taken part and advocates have come from as far as California, Florida and Massachusetts. Parents who have lost children in campus fires add a very poignant perspective to the meetings, as well as burn survivors from college fires. In the past few years, an educational program has been added to help give everyone a better understanding of the issue of campus fires and the role that legislation can play in helping to reduce the impact that these fires have on students, both today and for future generations. This year included a very special component, the documentary “After the Fire”, which is the story of the Seton Hall University fire in 2000 that killed three students. It tells not only about the fire, but the arson investigation as well. But what made the biggest impact is that it focused on the long recovery of two students, Shawn Simons and Alvaro Llanos and the impact that the fire had on their lives. What really brought this home for everyone there was that both Shawn and Alvaro were there with us on Capitol Hill this year. Sharing their story made such a huge impression, particularly to the students, who were only in first or second grade when the tragedy happened. The story, however, is timeless. Following the documentary, three Congressional staffers joined us and spoke about advocating for legislation from the staffers point of view. Staffers meet with a LOT of people on a wide variety of topics, so making your issue one that stands out is important. They provided the insider’s perspective on how to do this effectively-be respectful of their time, be polite, be sure to have a specific “ask”, and follow up with a thank you and additional information. They did tell some interesting stories about visits that they have had that didn’t work well, for example, people coming in and yelling at them! They also answered questions and talked about what it is like, working on Capitol Hill, which many of the students were very interested in. While it is certainly a demanding job, it is one that is very rewarding and the learning experience cannot be matched. Many of the students did not realize just how young the staffers are, that they are often just a few years older than the students and may have just recently graduated themselves. On to the Hill! The next day, everyone had breakfast in the Senate Russell Building and then walked outside (quickly, in the very brisk weather) for the obligatory picture on the steps of the Capitol Building. The teams then split up and headed off for their assigned meetings, in the Senate buildings in the morning and then in the House in the afternoon. Each team was made up of three people and they were mixtures of students, parents, fire officials or advocates, but each team had at least one student on it. The staffers were all very receptive and the fact that we have been there consistently each year is really starting to pay off. They remember us, they remember that the legislation is important to us, and in many cases, they had co-sponsored it last year and were willing to come on board again. The schedule focuses on the Members who are on the committees that will be first handling the legislation, which is a critical step in getting it voted on by the full senate. A big advantage in the time of year that we are there is it is when Congress is not in session. Since we are always meeting with staffers (who are the key people to meet with-they are the ones that make the recommendations to the Member), they are more relaxed and not as pressured because the Senator or Representative is back in the district and there is not as much activity for them to be involved with. There were four specific pieces of legislation that we were focusing on. At the time of our meetings, none of them had been introduced, but several have since then. This actually worked out well because it gave us an opportunity to get back in touch with them and let them know about the bills. This legislation will provide $15,000,000 in matching grants to schools to develop and deliver campus fire safety education programs. This will be instrumental in teaching students how to protect themselves from fire not only for the time they are attending school but for the rest of their lives. This will help to educate the future generation about fire safety and reduce the burden of fire on our society and economy. This legislation will reduce the depreciation schedule for the retrofit of an automatic fire sprinkler system in a high-rise property. It would allow small and medium sized businesses, which many off-campus house and apartments qualify as, to recover up to $125,000 of the cost of a fire sprinkler retrofit in a single year. Since over 85% of the fatal fires occur in off-campus housing, this bill will serve as a strong incentive for landlords to install automatic fire sprinkler systems in the very places where students are dying. It is estimated that a $125,000 sprinkler system would cover a 50,000 square foot property. This legislation will provide for 50% matching grants to schools to for the installation of fire sprinklers, fire alarms or mass notification systems. This resolution will continue the tradition, first started in 2005 by the late Congresswoman Stephanie Tubbs Jones, of recognizing September, along with proclamations issued by governors across the nation, as National Campus Fire Safety Month. Call to action: Contact Congress! You can be a part of this effort as well by contacting your own Senator and Representative and asking them to become co-sponsors of these bills. That is what really makes the difference, hearing from constituents. You can find the contact information for your Members by going to www.congress.org and entering your address. If you should need any additional information on the bills, please contact Ed Comeau, Campus Firewatch, ecomeau@campus-firewatch.com or 918-926-6328.